Water resources in a number of rivers in North and Northwest China are being overexploited, and total consumption across the country is already nearing the level forecast for 2020, officials said. Water in the Haihe, Yellow and Liaohe rivers and other waterways is being consumed at a rate that is close to－or even greater than－the recharge rate, the Ministry of Water Resources said on Sunday, World Water Day. 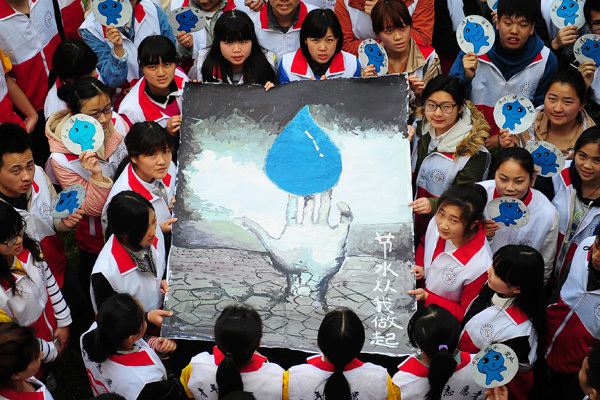 The State Council forecast that total water consumption would reach 670 billion metric tons in 2020. However, the consumption rate in 2013 was 618 billion metric tons. The water exploitation rate measures the amount taken from a river basin against the total available. The rate for the Haihe River was 106 percent in 2013, while the rates for the Yellow and Liaohe rivers were 82 percent and 76 percent. The level of overexploitation in rivers in Northwestern areas, where water shortages are more severe and droughts are more frequent, could be even higher, said Yan Yong, an official at the ministry's Department of Water Resources. There is a severe geographic imbalance of water resources, and the country also has a shortfall of more than 50 billion metric tons of water a year, according to the ministry. Li Ying, head of the ministry's Department of Policies, Laws and Regulations, said a draft regulation on the conservation of water resources nationwide has been drawn up in partnership with two other central government departments. It is due to be presented to the Legislative Affairs Office of the State Council for approval soon. "More legislation is needed to guide the country's water conservation efforts, as the laws and regulations are inadequate and unsystematic," he told a media briefing on Sunday. A regulation designed to prevent overexploitation of groundwater is also being drawn up, he said. The country has announced plans to build 172 water conservation and supply projects, of which 57 projects are already under construction, according to the ministry. Work on a further 27 is due to start this year. Agriculture is a key area for the conservation efforts as it accounts for more than 55 percent of the country's water consumption, according to the ministry.